Most students are familiar with the basics of (classic) spanning-tree: how a root bridge is elected, how the switches decide what interfaces become designated, non-designated, root ports, etc. Once the topology has converged, it doesn’t stop. Every time a switch receives a BPDU, it has to make decisions. When the topology remains the same then the switch will keep making the same decisions over and over again. Things become interesting when we do have a change in the topology. 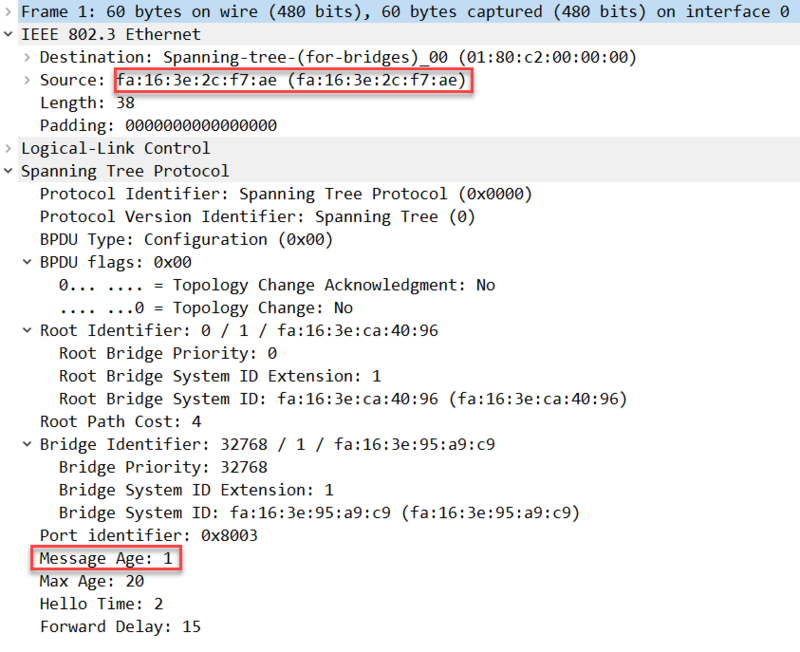 How does spanning-tree adapt to changes in the network? 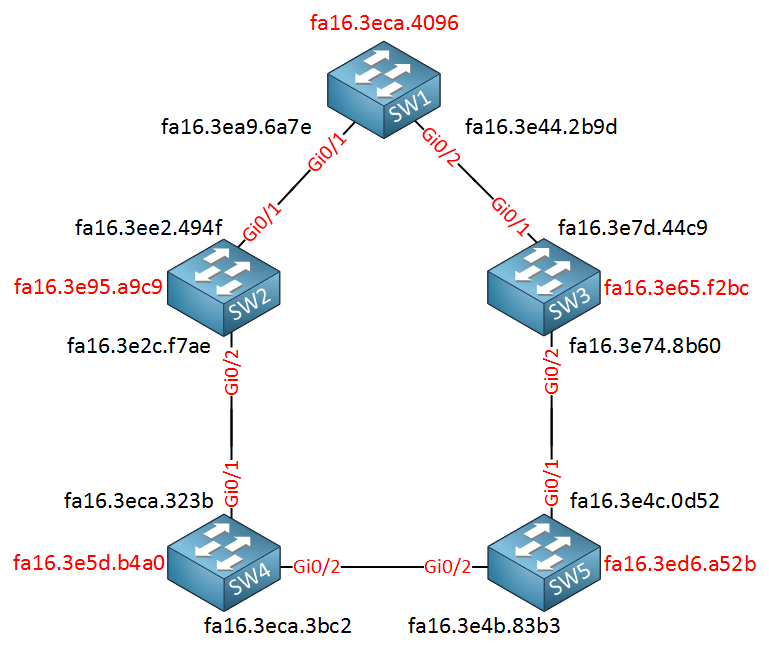 In this lesson, we’ll take a look at what happens behind the scenes when the topology changes. I’ll show you the different BPDUs and the decisions that each switch will make. Before we start messing around with topology changes. Let’s take a look at the different BPDUs that we see on the network. The MAC addresses in red are the MAC addresses that are used as the bridge identifiers. 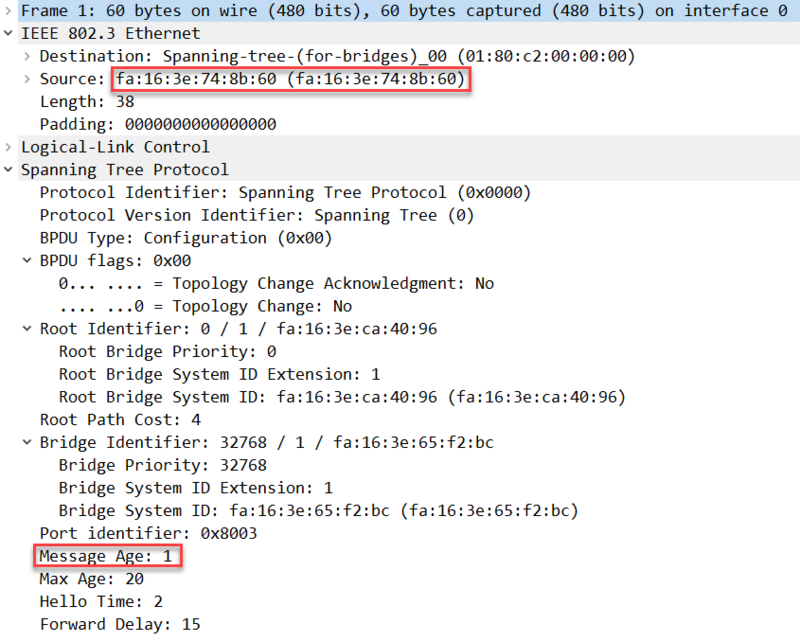 Spanning-tree will select a MAC address of one of your (lowest) interface numbers. In my case, those were the GigabitEthernet 0/0 interfaces that I am not using in this topology. The MAC addresses in black are those of the interfaces. Above we see the BPDU that SW1 sends towards SW2. You can see the bridge identifier with the MAC address of SW1. I set the bridge priority to 0. Also, we can see the message age is 0. This value determines how far you are away from the root bridge. Each non-root bridge will increase this value by 1. The message age is used to determine when a BPDU expires. You take the max age value (20) – message age (0) = 20 seconds. Switches further away from the root bridge will expire their BPDUs sooner. The contents of this BPDU are the same except for the source address. The information in the BPDU is similar. SW1 is the root bridge and generates a topology change trap, nothing else happens here. You can see this event occurs at 2:50:32. SW2 is no longer receiving BPDUs from SW1 so it has to select another root port. You can see it is receiving a BPDU from SW4 (fa16.3e5d.b4a0) who claims that it is the new root bridge, superseding SW2 as the root bridge (fa16.3e95.a9c9). For a short while, SW2 and SW4 are both isolated from receiving BPDUs from SW1 since SW5 is not forwarding any BPDUs on its blocked interface. About a second later, SW2 does receive the superior BPDU that is originated from SW1 and uses this as the root port. The new root port was discovered at 02:51:11 so it took about 39 seconds. Nothing much happens on SW3. This makes sense it’s root and designated ports didn’t change when GigabitEthernet0/1 on SW1 went down. SW4 was temporarily thinking that it was the new root bridge since it doesn’t receive BPDUs from SW5. Within the same second, SW2 has sent the superior BPDU from SW1 so for a short while, SW4 reconsiders Gi0/1 as its root port. Once SW5 starts forwarding BPDUs, SW4 will use this interface as its root port. SW5 is not receiving any superior BPDUs anymore from SW1 on its GigabitEthernet0/2 interface. This causes it to leave blocking mode, entering the listening and learning state, ending in forwarding mode. 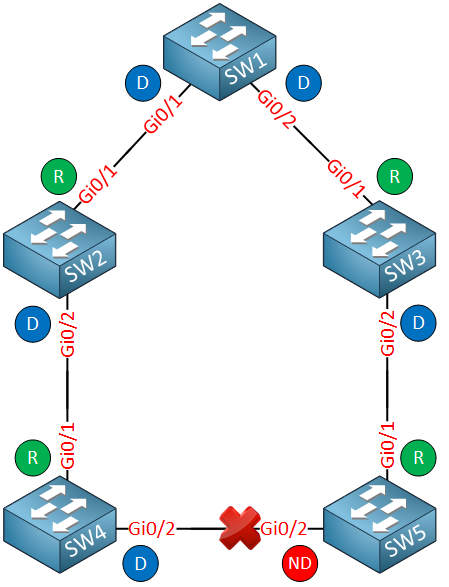 SW1 is the root bridge, generating a TCP trap. Nothing interesting happens on SW2 since its root port remains the same. Nothing much happens on SW4. It’s root and designated ports remain the same. SW5 is no longer receiving BPDUs from SW1 on its GigabitEthernet 0/1 interface so it loses its root port (GigabitEthernet0/1) and it has to figure out which interface will become the new root port. Since SW3 temporarily claimed itself as the root bridge, SW5 is receiving this BPDU. It is also receiving the superior BPDU from SW1 on its GigabitEthernet 0/2 interface so this interface will move from the blocking state to the listening, learning and forwarding state. This becomes the new root port. In this lesson, we have seen what happens behind the scenes when spanning-tree has to reconverge. You have seen the decisions that each switch makes based on the BPDUs they receive (or don’t receive). -Second scenary: BPDUs between SW2 and SW4: “Since SW2 temporarily claimed itself as the root bridge”, it should say “Since SW3 temporarily claimed itself as the root bridge”. Let me get to knoe im a mistake, thanks. 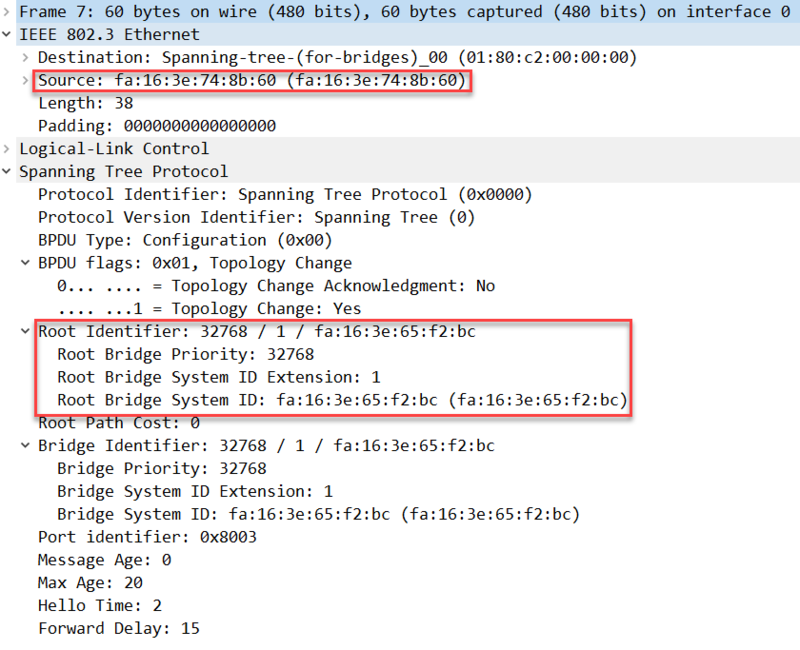 When the root bridge looses a connection like in the example shown, why does it not send a TCN? Why only a TC trap is generated? It lost one of its designated ports. Or is that not a topology change from the roots perspective? When a new root port is elected on a switch and the new root port is the former designated port, there is now listening/learning/forwarding process happening, right? Because the port did that already and is already in a “forwarding” state!? Only if a port is in blocking state or the port just came UP, correct? I thought it might be faster for the root bridge to send a BPDU with the TC bit set right away when it realizes that a link is down, instead of waiting to hear from other switches in the network through a TCN and then sending the BPDU with the TC set. Concerning Question 1, if a root bridge learns about a topology change that is due to the change of state of its own interfaces, then it will immediately know of the topology change, so it does not actually have to “wait” to be informed by other switches. 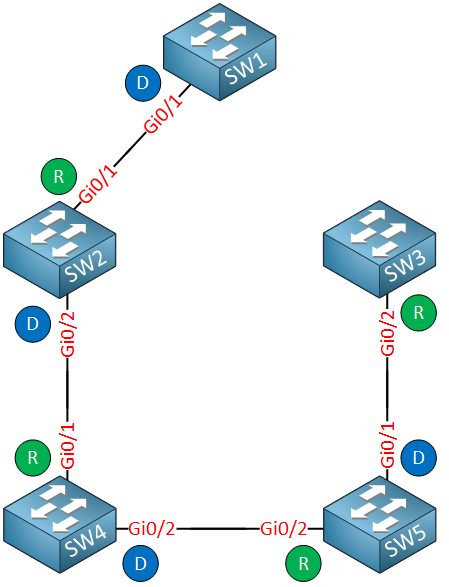 Once again, the TCN is sent to inform all the switches between the location where the topology change took place and the root bridge of the TC.